I’d left Ljubljana, Slovenia for Bratislava, Slovakia because of my plans/ticket to fly from Bratislava to Tel Aviv, but I had a full week of more in Bratislava and although the capitol, it’s not a large city for a person traveling through and staying at a hostel. It’s common for a traveller to stay in Bratislava and do a day trip to Vienna, Austria which is just 100k away, only €5 ride each way. I’d considered doing this, but I’d been to Vienna and much of Austria on my first world travels (those epic 3 years of solo travel). It’s also common to go to Budapest, Hungary from Bratislava. That’s a 3-hour train or bus ride. However, I’d also been to Budapest and other places in Hungary during those first world travels. The other popular destination is Prague. It’s also a relatively short train or bus ride. As I had not been to Prague or any of what was Czechoslovakia during my first travels, I decided that a couple of days in Prague, Czech Republic (as it is now called) would be a new experience and more worthwhile. So today, having relaxed and enjoyed much of Bratislava at my leisure, and knowing I needed to be back there for my friend Annaline to arrive and travel with me to Israel, it was the perfect time to take my side-trip. I got out of bed at the Hostel Folks hostel in Bratislava, Slovakia around 9 and showered. (I really loved the showers there!) Then I selected some things to take to Prague in my ChicoBag daypack and packed up my main backpack (the EagleCreek Hauler) to leave at the hostel for the next two days. I am bringing only my daypack. I am wearing the sweatshirt dress (I bought my first evening in Bratislava) because there is no chance it will fit into that daypack with anything else in there and I certainly wanted to have it if the weather was as cold in Prague as it has been in Bratislava these past few days! Into my Sea To Summit dry sack, with me since 2012, I packed the other new long-sleeve shirt I’d bought my first evening in Bratislava, the tee-shirt and shorts I have been sleeping in, my red silk shirt, and leggings. 2 pairs of underwear, a spare bra (always, just in case), my 1 pair of Travelsox socks, and my favorite red silk shirt. They went into a ziplock bag. A backup drive is in with them. My Matador NanoDry towel is in a ziplock. Rather than take my entire green hard case, I am using my Lewis N. Clark 3-1-1 bag. In it, I have my one Brincatti shampoo bottle, toothpaste and toothbrush (although I could have just used my travel brush and toothpaste that is in my handbag), CocoaFloss dental floss, and my First Aid cream from Sweden. I have my comb in my handbag. (Funny but I haven’t seen my hairbrush since Ischia or La Spezia, but haven’t missed it much). And, of course on these rainy days, I have my Fjord Folding Trekking Umbrella by Innate conveniently placed in one of my daypack’s side pockets as it has been for days. I put the rest of my stuff into the backpack I was keeping at the hostel or the locker I was being permitted to maintain during my absence because it was off-season (and I am so nice). When finished, I asked the Reception women for help planning my transportation plan. 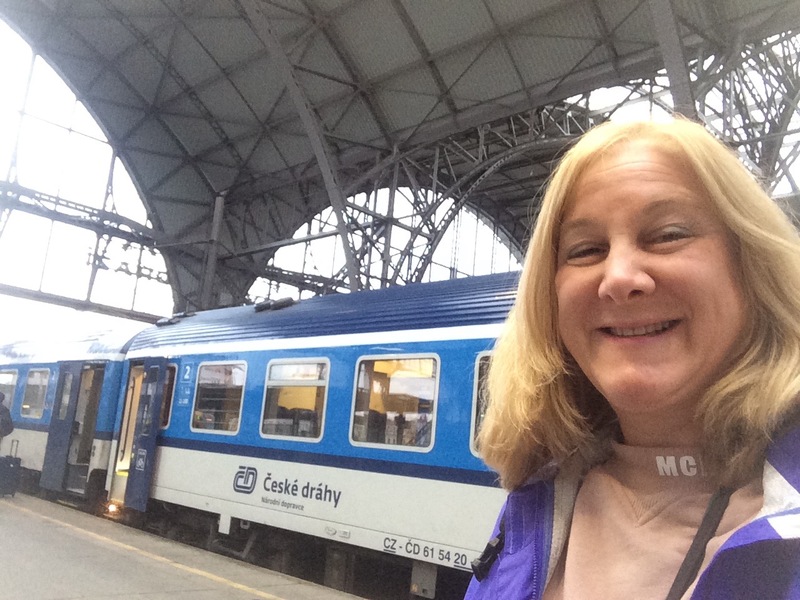 I had a choice between train or bus to get to Prague and I tend to favor train. But the distance between the bus station and my destination hostel in Prague was my deciding point. 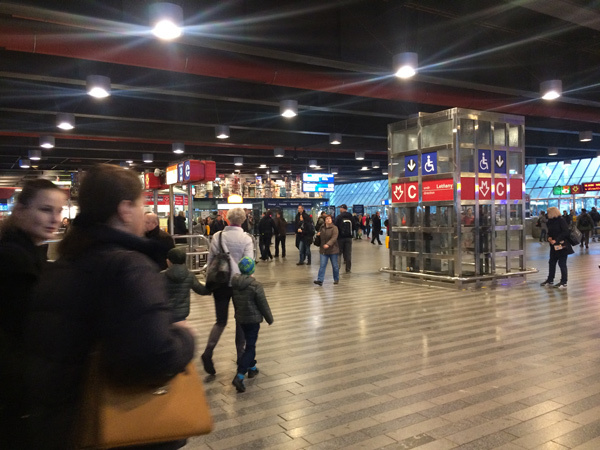 It is nearly 1 mile closer, 1.5k, from the Prague train station to the Mosaic House Hostel than it would be if I arrived into the Prague bus station. She looked up the train schedule and status and saw that the train was running on time. Sometimes it is delayed by up to 2 hours, I’d learned from the Hostel Folks staff. A delay would perhaps have had me take the bus. As it’s a national holiday, trams are on a limited schedule, so she checked the tram as well and found I need to take the 11:35 Tram #1 today in order to make the train. 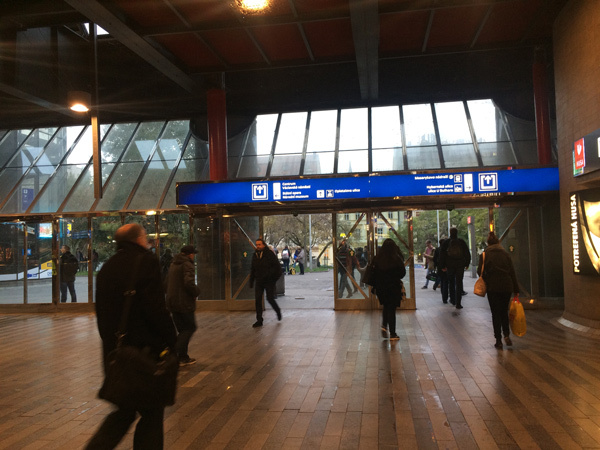 It is 9 minutes to the train station, the final stop. The pressure was on. No relaxed walk, no missing seeing the stop. Luckily, I am familiar with the stop as I have walked past it many times. I only haven’t ridden the tram, as tempting as it was. Because in Italy bus tickets needed to be purchased from the tobacci shops prior to riding, I asked about this Slovakia tram ticket. 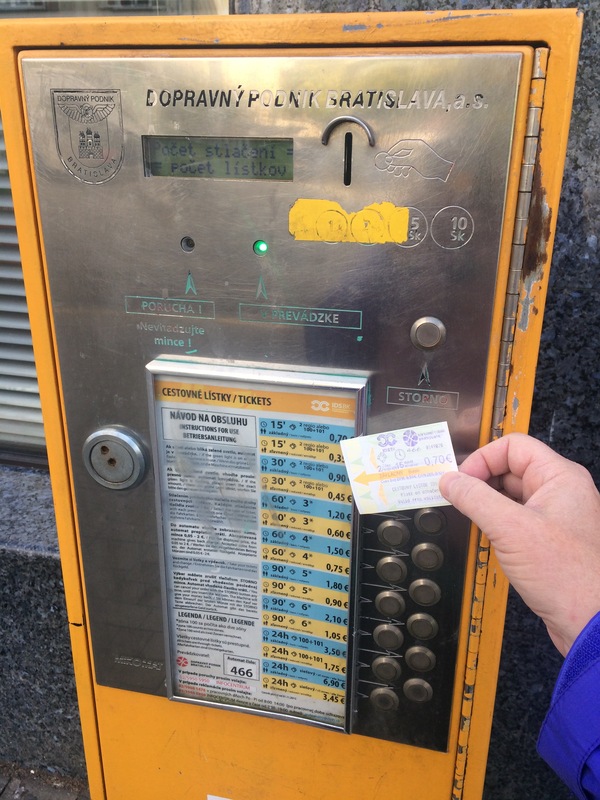 She told me to buy the tram ticket from the vending machine at the stop. 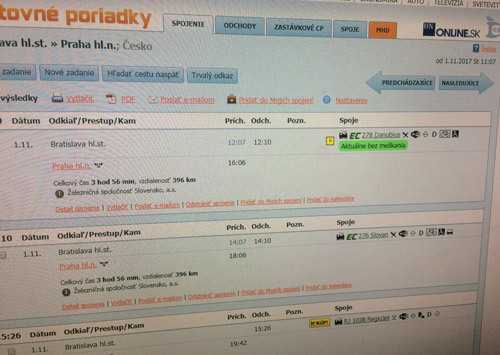 €.70 for a 15-minute ticket for this 9-minute journey. The machine gives change. However, I had exact change ready. I have to admit that as I was figuring out the machine, a local person offered to help so this was really easy for me. I had my ticket in hand several minutes before the tram arrived. 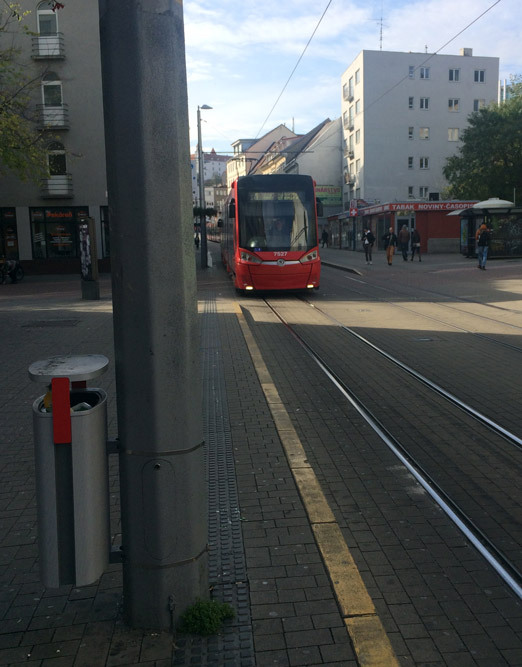 The #1 Tram that took me to the Bratislava train station. Tram ticket purchased! With a little help from a friendly local. After validating my ticket, I sat and enjoyed the short ride. It was easy to know I was at the train station because, among other things, every rider got off. As I stopped to take my traditional photo of me and the tram, I noticed everyone going up the stairs so it was easy to put 2 and 2 together and know the ticket booths were up there. In fact, they were up the stairs and visible as soon as I reached the top. I paid for the RegioJet train ticket at 11:48. It would depart at 12:05 from Track 1, the ticket agent told me. Signs led the way but were a bit confusing. Luckily I had asked someone to verify that I was, indeed, at Track 1. A college student had heard, so when he and his friends realized that the announcement we were hearing on the PA system was for a track change, he told me and I followed. I do typically listen closely to announcements but I had spaced out or was busy taking a photo so I heard it but didn’t pay attention. The guys invited me to sit with them in a compartment but I actually wanted to be alone and write or to meet Mr. Terrific if that was meant to be. They also needed to sleep so I politely refused and I went to the regular seats I had noticed in the next car. Most people were couples and groups. There is power on board, an electrical outlet under the table that’s between the facing seats, so I plugged in my iPhone. Unfortunately, my phone’s Miami airport dysfunction continues and I can’t use it while it is charging so I alternate. The official came through to check our tickets. The official came through to check our tickets. At 12:35 an official vendor came through with a cart selling coffee, hot chocolate, beer, sandwiches, and snacks. I bought a coffee, perhaps 12oz, for €2 and as my phone charged, I sipped it slowly and dined on my not-quite-gourmet Mackerel and croissant lunch. Having noticed earlier that the boy on the other side of the aisle had placed his garbage into a metal container that is built into the train seats, I placed my thin plastic bag of crumbs and creamer and sugar refuse into the one behind me on my right. It contained a discarded bag of chip snacks and two Starbucks coffee cups. I was saddened to see the costly Starbucks craze had hit Slovakia or Czech Republic too. Benvenuto in Rep. Ceca! Da oggi con TIM ti senti a casa in tutta Europa: puoi continuare a chiamare, navigare e inviare sms utilizzando la tua offerta nazionale, SENZA COSTI AGGIUNTIVI, nel rispetto delle politiche di utilizzo corretto dei servizi di roaming ai sensi del Regolamento UE 2016/2286. Per info vai su tim.it o chiama gratis il 119.Puoi effettuare una ricarica su tim.it o farti ricaricare dall’Italia. Per i servizi di emergenza è disponibile il numero gratuito 112. 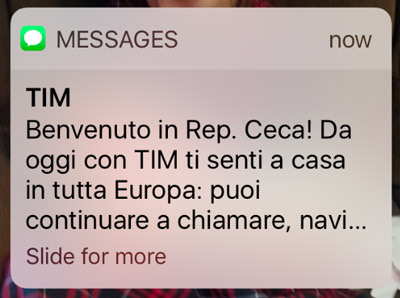 Buona permanenza da TIM! Welcome to the Czech Republic! From today with TIM you feel at home all over Europe: you can continue to call, surf and send sms using your national offer, WITHOUT ADDITIONAL COSTS, in compliance with the policies for the correct use of roaming services in accordance with EU Regulation 2016/2286. For info go to tim.it or call 119 for free. You can top up on tim.it or recharge from Italy. For emergency services, the free number 112 is available. Enjoy your stay at TIM! Happily, all stations have been well announced in English as well as local languages. Here is some of what I saw from my window. Walking out from the Prague train station to the main street. Then depending on my synagogue experience maybe I’ll continue through some of the old city, get some dinner, and continue to my home for the next couple of nights, Mosaic House Hostel. Here’s my TripAdvisor review of Mosaic House Hostel.